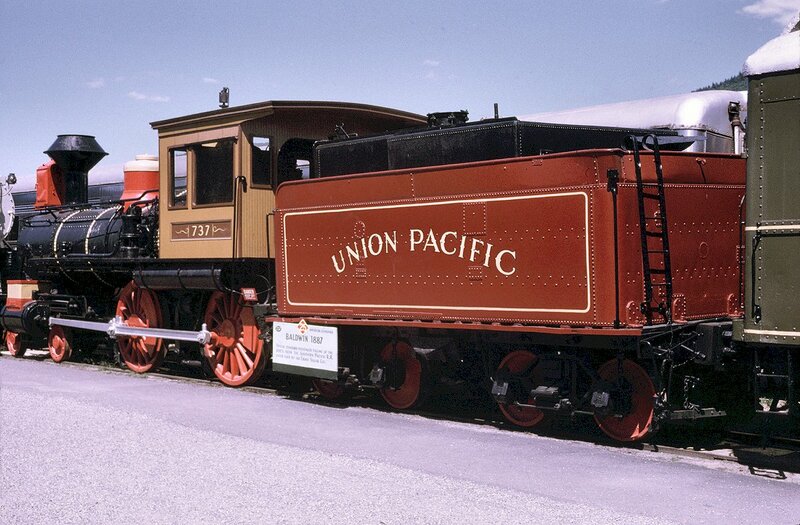 The 4-4-0 or "American" type locomotive was widely used in North America during the 1800's. This wheel arrangement was well suited to the grades and curvature of the railroad of that time. Around 25,000 4-4-0 locomotives were built by companies including Rogers, Baldwin, Cooke and Mason. However, the design required the firebox to fit between the driving wheels which limited its firing (and thus steaming) capacity and by 1900 larger locomotives were needed. 737 (216) E-31 4-4-0 4'-8½" UP (SP) The Double T, Stevenson, CA display Baldwin #8395, 1887 from Portola. Some list this engine in Merced or Turlock. 999 C-14a 4-4-0 4'-8½" NYC&HRRR Museum of Science & Industry, Chicago, IL display NYC&HRR, 1893 First steam locomotive in the USA claimed to have reached 100 mph (1893). 1011 4-4-0 12" (NULL) C&H Railroad, Tecumseh, KS operational Ottaway Built sometime between 1946 and 1948. 1 4-4-0 4'-8½" Ford Greenfield Village, Dearborn, MI out of service Manchester Locomotive Works, 1870s Named Edison. Rebuilt at the Rouge Shops from an 0-4-0 in 1932 to represent an 1800's William Mason by Henry Ford. 110 (3) 4-4-0 4'-8½" J.J. McDonough Lumber (Atlantic & Gulf) Henry Ford Museum, Dearborn, MI display Rogers #812, 01/1858 Named Sam Hill, operated in the 1930s when Henry Ford opened and carried President Hoover to the opening of Greenfield Village in 1929. 7 4-4-0 ng Tropicana Laughlin Hotel and Casino, Laughlin, NV stored operational Custom Fabricators Built as a 2-4-0 for a Sea World theme park. Donated to Las Vegas Railroad Society. 3 4-4-0 24" City Island Railroad, Harrisburg, PA operational Crown Metal Products (Elizabeth) Named The General. 4-4-0 ng Carowinds Park, Fort Mill, SC display Crown Metal Products (Elizabeth) Duplication of the Crown in Huntsville? converted to gasoline? 3 4-4-0 15" W&ARR Ooltewah, TN private restoration Crown Metal Products (Elizabeth) Named LiL General. From the upper mid-west.